If you run your own blog with WordPress, a nice way to help you to connect with your readers is by displaying some information about yourself – you can do this on your blog’s about page where it might not been seen, you could also display a short bio on each post or in the sidebar where it is more likely to be viewed. This is known as an author box, and typically you will include a short bio about yourself, maybe your photo and some links to your social media profiles. 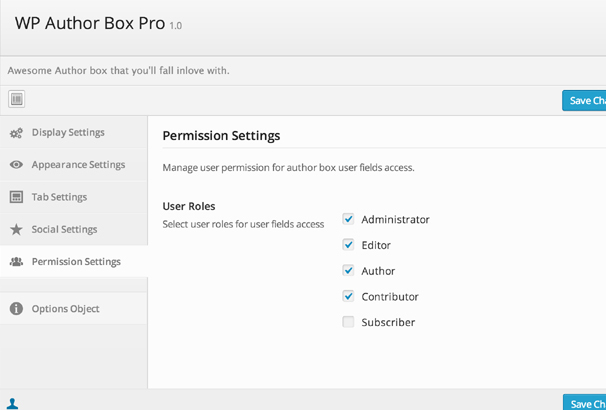 If you run a multi-author blog, then author boxes become even more important – being able to differentiate between authors is a way for your readers to see who is writing this particular piece and it’s also a good way for authors to grow their following. By default, WordPress does include some author information which is displayed in different ways depending on what theme you are using and what how the theme author decided to style and present this information. Sometimes though, you might want to expand this info, display it differently or place it in a different position on your site – that’s where a plugin can come in handy. We have put together this extensive collection of all the free and paid Author Box plugins we could find, take a look below and find the perfect plugin to compliment your site and start informing your readers about who wrote the content they are reading. 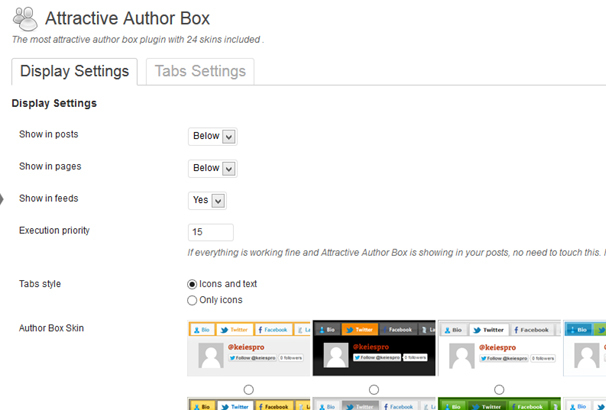 This plugin comes with an advanced widget that helps you to display your blog authors in the sidebar. It allows you to display author gravatar, post counts, author biography, and URLs. 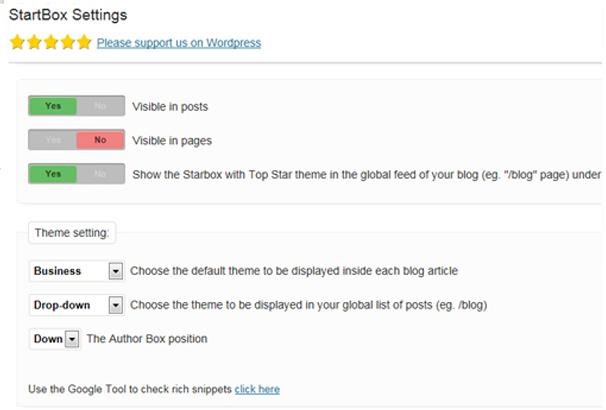 It has 8 configurable options which work perfectly on every WordPress theme. 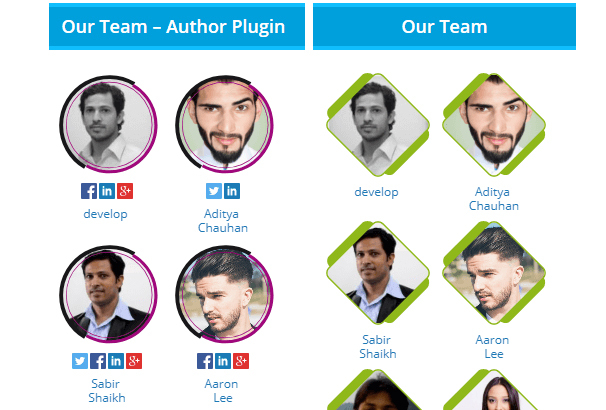 This plugin comes with a widget that allows you to display blog site authors with their details such as author description, an avatar in the sidebar. You’re allowed to arrange the order of the authors by many selection types and hide the author without posts. This plugin also comes with lots of amazing features such as 3 predefined templates, post counting options, customizable avatar size and much more. 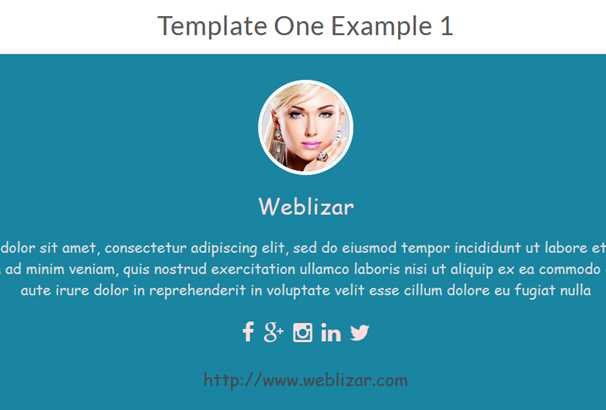 Modern multiple author widget WordPress plugin allows you to display multiple author in a modern and responsive animated slider. This plugin comes with lots of features such as gravatar profile images, a responsive slider that slides among authors, author website URL, biography, author social links, fits perfectly into any WordPress theme, unlimited support, easy installation & setup and much more. This plugin allows you to create unlimited profile structures and unlimited ads that help you to make more money by advertising on your user’s profile. It has unlimited color schemes and you can choose any custom color that you want. You’re also allowed to unlimited social networks and create unlimited widgets and create unlimited widgets fields and much more. This plugin comes with 15+ pre-designed templates, author post counts, social media feeds, custom tabs, pop-up display, unlimited color schemes, and author box post customization. You’re allowed to set profile image from social media profiles as Facebook, Twitter, Instagram or upload a custom image. This plugin is 100% responsive and it works well on all devices from mobile, tablet, laptop to desktop. It has some clean templates, some unique and fancy templates and much more. 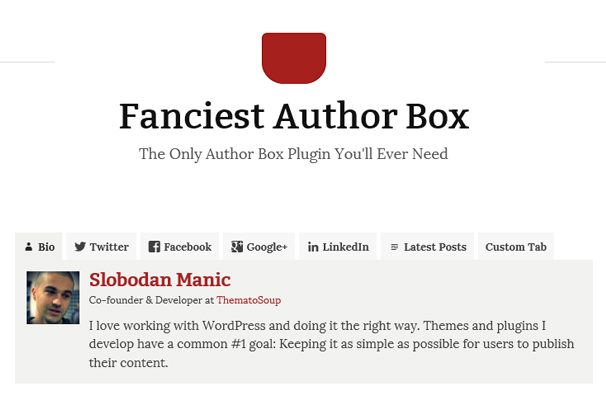 Fanciest author box WordPress plugin is very easy to use and customize. This plugin comes with lots of useful features such as Google authorship, retina ready display, translation ready, RSS feed author box and much more. It has randomized author option for widgets and color pickers to set your own color settings. You’re also allowed to use this plugin as a widget, shortcode or as a template tag. 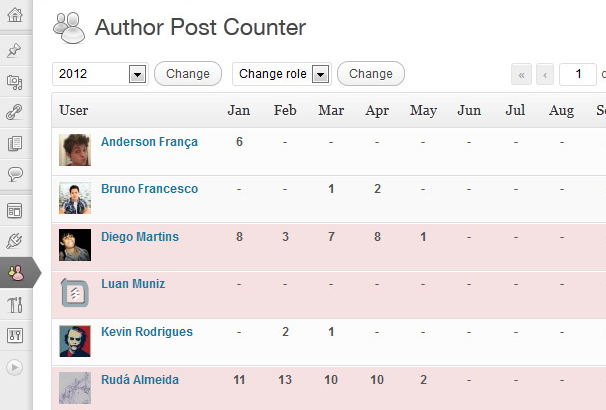 This plugin helps you to manage how many articles are written by each author on your blog site. You can filter, the author list by years and roles. You can use this plugin as a widget and highlights in the red background. This plugin is ready for translation and has gravatar option for users. This plugin can embed items and authors information from Evanto marketplaces into your website. All these can be done using simple shortcodes and widgets. 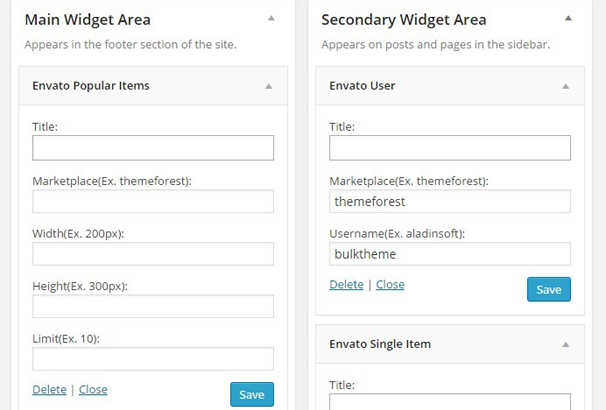 This plugin has different types of shortcodes, 9 widgets, and 3 different types of dashboard widgets. This plugin also automatically adds your referral URL for each item so you can also make money with your affiliate links. 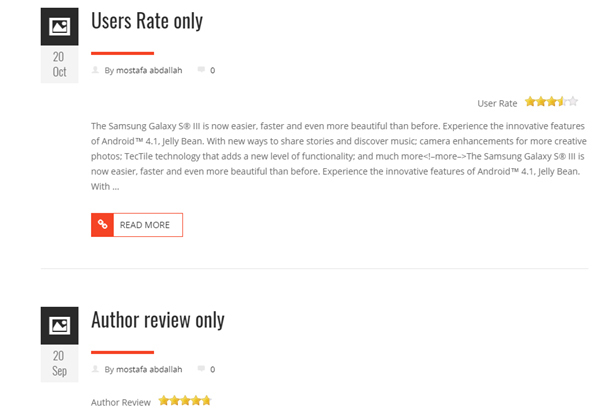 This plugin allows you to review and rate your posts with various review types such as Star, Percent, and Point. This plugin comes with lots of features such as WMPL support, Responsive layout, Unmilited review options, Allow users to create when they are logged in, allow users to change the rating and much more. This is the most attractive author plugin on the market. It has 24 skins, live preview of skin selection, social networking support, shortcode and template tag options, Google authorship verification option and much more. 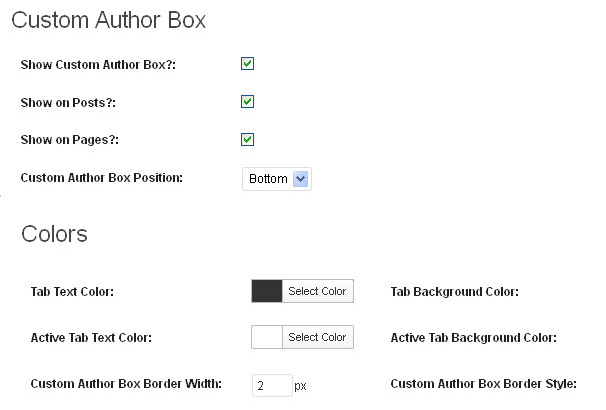 You can place the author box anywhere on your website by using shortcode and template tag. This plugin is 100% responsive and works perfectly on every device and works with all custom post types. 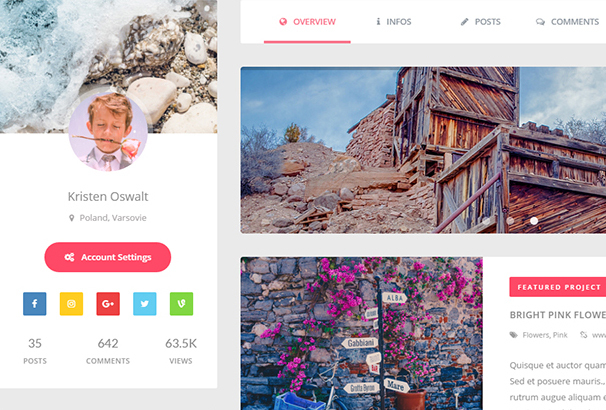 It also supports all major social networks and automatically added to the top or bottom of your content. You can easily add the author box anywhere on your site using the custom shortcode or the included widget. WP – author box WordPress plugin is an awesome box that you’ll fall in love with, It gives you full control of an author box and comes with google authorship integration option. It allows you to create unlimited tabs, widgets, and shortcode. This plugin comes with 6 predefined skins which are fully customizable. It has responsive layouts and tabs that work with every modern browser. This is another powerful WordPress plugin that can be used to display a list of posts by a specific author. This plugin comes with 15 options to choose from on a per-widget basis. This plugin comes with lots of features such as display posts by an author, show more posts by current author, display post thumbnail size control, offset control, display post excerpt and much more. This is an advanced WordPress widget bundle which included advanced blog authors widgets, posts by taxonomy widget pro, posts by author widget pro, better-related posts widget, better recent post widget pro, better recent comments widget pro. This bundle is really helpful who wants to add author widgets on their blog with an ease. This plugin enables you to display author list on your site by using a widget. You are also allowed to change the default setting as your needs. Just need to select the authors from the list and add the post number. You can download it for free and use it anywhere on your site. This plugin allows you to add authors with their social media links. It has also an option to add an author avatar and background color changing options. This plugin is free to download and very easy to install and configure as your needs. With this plugin, you can easily display the list of authors in the sidebar and make author competition to post an article. You are allowed to change the gravatar image size as your needs and display in tabular format. This plugin is 100% responsive and compatible with all browsers. 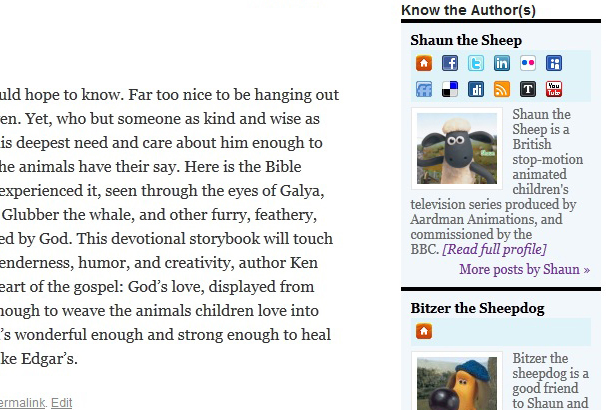 You can display the author list by adding the shortcode in the post or anywhere on your site. 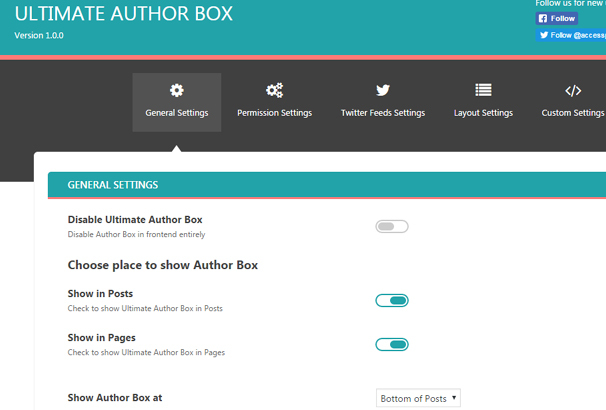 This is another exclusive WordPress author plugin which is very easy to customize. This plugin allows your authors to add their social media accounts on their profile. You are also allowed to set the author name and set their job title on their profile. This plugin helps you to display rich snippets in the Google search results and links all the articles were written by the author. This plugin allows you to display WordPress author information in a stylish way. This plugin comes with lots of features such as complete author profile, author biography, author description with their website list, 2 different types of author templates and responsive design. You can easily add author information anywhere on the website by using a shortcode. This plugin provides a simple widget which allows you to display your blog author’s information including their gravatar and post counts. This plugin uses universal widget styling option which is perfect for any types of WordPress theme. This plugin comes with lots of features such as a blog author widget, widget title option, author post counts options and author gravatar displaying options and much more. 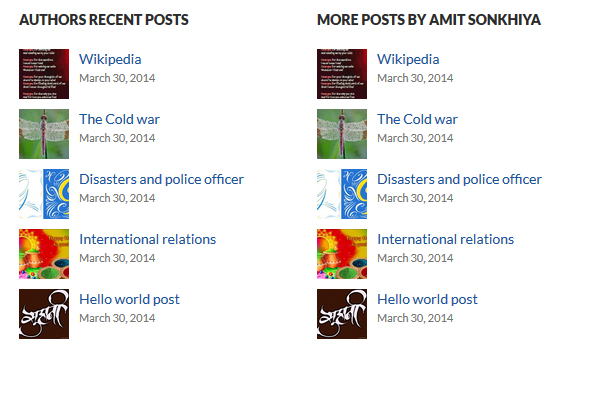 This plugin is perfect for showing off recent posts by an author by using a widget. You are allowed to set the number of posts to display, hide or show a featured image, dimensions of the featured image, display post date and much more. To show this widget, you need to add the generated shortcode from the widget or use do_shortcode function in the theme. This is another useful WordPress plugin that allows you to add author’s social media links and author picture or gravatar on any post that has an author. You are allowed to change the title, limit author profile characters and the read more text. This plugin is 100% responsive and works perfectly on mobile devices. Thanks for sharing the post we loved many of the plugins that you have shared and will be looking to use one of them from the list for our own site.